The heyday of Victor Davis and his teammate Mike West took ROW to the world-class stage. These ROW powerhouse members made waves by grabbing five Olympic medals in 1984. At the time, this achievement was a Canadian record for any amateur sports organization competing at a single Olympics. At the ‘84 games, Davis collected three medals, including gold in the 200 metre breaststroke and silver in the 100 metre breaststroke and in the 4x100 metre medley relay. And the Waterloo community and the country were thankful. When the pair came home, they had their own float in the K-W Oktoberfest parade and later were inducted in the Waterloo County Hall of Fame, the Canadian Amateur Sport Hall of Fame, and in 1984, Davis received the Order of Canada. Davis was also named Swim Canada’s athlete of the year three times. Davis was also inducted in the Canadian Olympic Hall of Fame in 1985 and Canada’s Sports Hall of Fame in 1990. Davis, who started swimming for the Guelph Marlins at age 12, was a world record holder in his specialty, the 200 metre breaststroke. 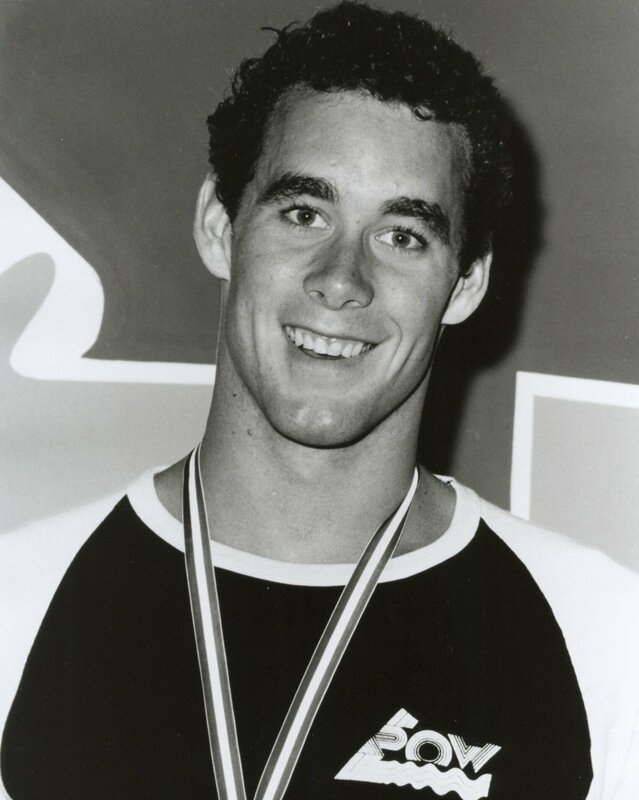 Davis also attended the 1988 games in Seoul, South Korea where he placed fourth in 100 metre breaststroke and took a silver medal in the 4x100 medley relay. Davis retired from swimming in July, 1989. Tragically, Davis’s life was cut short. On Nov. 11, 1989, he was run down by a car in Montreal outside a nightclub. He died two days later in hospital. He was 25. Kevin Auger, who swam with ROW under coach Cliff Barry from 1980 to 1984, fondly remembers Davis as a “little punk” who like some young male swimmers was fooling around more than he was swimming. Auger recalls how Barry wanted to get Davis to focus so he threw him into the lane with senior swimmers Auger and his peer Alan Swanston, who was also a national champ swimmer. Swanston is now the head coach for the Newmarket Stingrays. Davis’s peer and fellow Olympian swimmer in 1984, Mike West recalls how he last saw Davis in 1988 when he went to Montreal. The pair had dinner and drinks. Davis was training in Montreal because he had followed Barry to the city after he left ROW. West said he was studying in the library at Queen’s when his brother-in-law came to tell him the news of Davis’s death. “I remember getting a frantic phone call from Cliff. I was in shock,’’ said West.